Ocarina of Time was revolutionary in its own right as the first 3D Zelda and pioneering a video gaming style which would later be recreated in series such as Okami and Starfox. Another revolutionary point which current developers could perhaps still learn from is the plethora of strong, balanced female characters. Initially I wanted to write about the Gerudo tribe, and perhaps focus on their status as an all-female society. 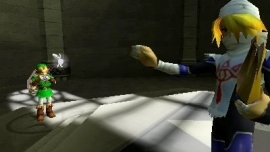 As I thought more and more about the direction this would take, I realised that despite the Gerudos’ status as a literal warrior race, the other females featured in Ocarina of Time are no strangers to courage, strength, and conflict, and it would be unfair to exclude them from an article as such. Seeing these women as developed characters and often excellent role models is amazing for a game released in 1998, when the gaming industry still seems to struggle sometimes with exactly that, today in 2015.